answers each question. Write the answer on the sheet provided. 2. The period of cell division is called ______. 3. 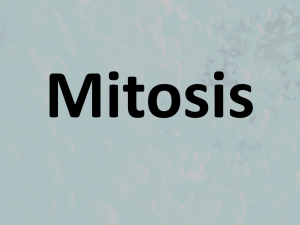 Mitosis has _____ phases. 4. 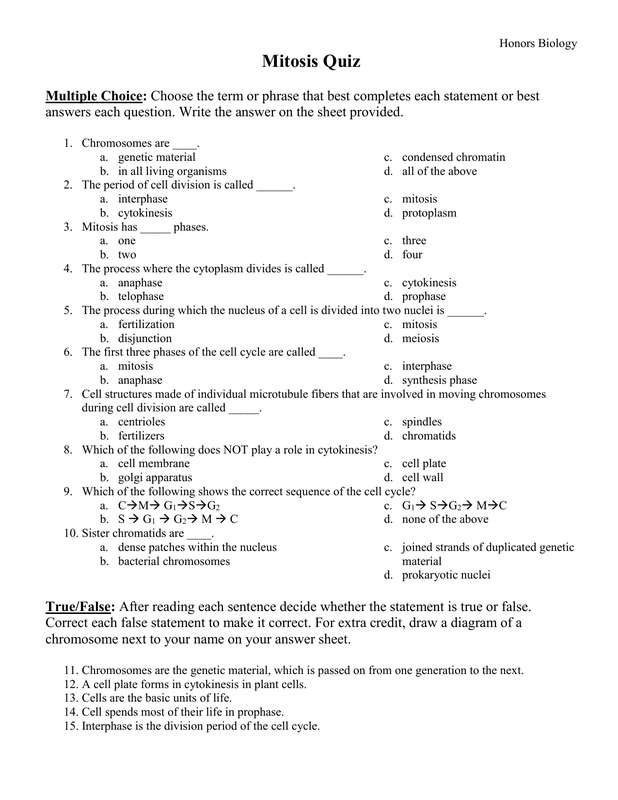 The process where the cytoplasm divides is called ______. 5. 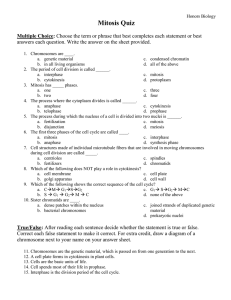 The process during which the nucleus of a cell is divided into two nuclei is ______. 6. 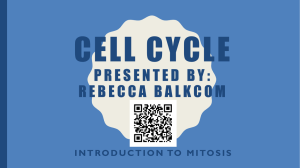 The first three phases of the cell cycle are called ____. 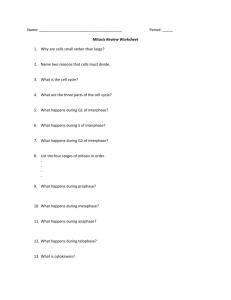 during cell division are called _____. 8. 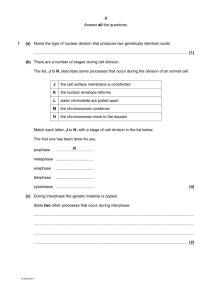 Which of the following does NOT play a role in cytokinesis? 9. 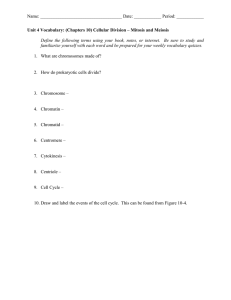 Which of the following shows the correct sequence of the cell cycle? 10. Sister chromatids are ____. True/False: After reading each sentence decide whether the statement is true or false. chromosome next to your name on your answer sheet. 11. Chromosomes are the genetic material, which is passed on from one generation to the next. 12. 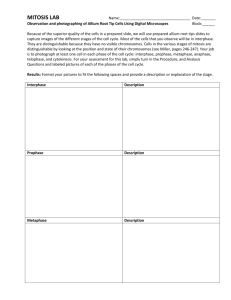 A cell plate forms in cytokinesis in plant cells. 13. Cells are the basic units of life. 14. Cell spends most of their life in prophase. 15. 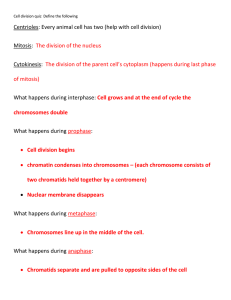 Interphase is the division period of the cell cycle. occurs. Some answers may be used more than once. 16. The nucleolus begins to disintegrate. 17. Chromatids separate at the beginning of this phase. 18. 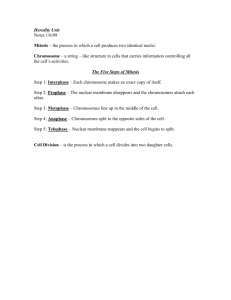 The chromosomes move toward the center of the cell. 19. A chromatid from each pair is now attached at each pole. 20. The cell grows rapidly. 21. Separate spindle fibers become attached to the centromeres of each chromosome. 22. Separate chromosomes are not clearly visible but the chromatin has become thicker and shorter. 23. A cell plate completely divides a plant cell. Short Answer: Answer each question as completely as possible. Use complete sentences.